Jane Lubchenco, an eminent marine biologist and leading scientific voice on issues of marine policy and environmental sustainability, will deliver the third annual Fred Keeley Lecture at UC Santa Cruz on Monday, January 29. Sponsored by the STEPS Institute for Innovation in Environmental Research, the lecture will take place at 7:30 p.m. at the Music Center Recital Hall on the UCSC campus. The event is free and open to the public. 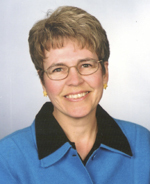 Lubchenco is the Wayne and Gladys Valley Professor of Marine Biology and University Distinguished Professor of Zoology at Oregon State University. The title of her presentation is "Seas the Day! Steps toward Sustainable Use of the Oceans." Lubchenco is recognized for her pioneering efforts to open the lines of communication between scientists and citizens on issues of marine policy. She has testified before Congress, addressed the United Nations, and provided scientific advice to the White House, federal and international agencies, nongovernmental organizations, and other groups. An environmental scientist and marine ecologist, Lubchenco leads an interdisciplinary team of scientists studying the marine ecosystem along the U.S. West Coast. This project, the Partnership for Interdisciplinary Studies of Coastal Oceans (PISCO), involves researchers at OSU, UCSC, UC Santa Barbara, and Stanford University. They are learning how the nearshore ecosystem works, how it is changing, and how humans can modify their actions to ensure continued benefit from ocean ecosystems. Lubchenco has served as president of the International Council for Science, the American Association for the Advancement of Science (AAAS), and the Ecological Society of America. A member of the National Academy of Sciences, she was a presidential appointee to two terms on the National Science Board. She served on the Pew Oceans Commission and participated in the Millennium Ecosystem Assessment, a five-year international scientific assessment of the consequences of environmental changes to human well-being. Her many awards and honors include a MacArthur Fellowship, a Pew Fellowship, and the 2005 AAAS Award for Public Understanding of Science and Technology. During her visit to UCSC, Lubchenco will also be participating in a panel discussion on "Women in Science and Engineering" with UCSC faculty and graduate students. This panel is cosponsored by the STEPS Institute, the UCSC Graduate Division, and Women Evolving Biological Sciences (WEBS). The Keeley Lecture Series is named in honor of Fred Keeley, a civic leader and former member of the State Assembly, who for many years has contributed to shaping environmental policy in California. For more information, visit the STEPS Institute web site or contact Abby Young at steps@ucsc.edu or (831) 459-1310. Parking for the lecture is available for $2 in the Performing Arts Parking Lot.